An edited version of the following commentary on the eurozone debt crisis appears in the latest edition of a magazine for official monetary and financial institutions and the original is posted here by kind permission of the publishers. Faced with a sovereign debt crisis that threatened to spread from Greece to at least Portugal and Spain, between March 25th and May 10th of this year the eurozone authorities progressively relinquished various constraints designed to maintain the ECB's solvency and detachment from fiscal policy. While the authorities' aim was to avoid a collapse of EMU as members unable to remain competitive and service their debts in euros seceded from the monetary union to reintroduce their own national currencies, the adjustments threaten to undermine the real value of the euro by weakening the ECB's balance sheet and setting precedents for similar accommodation in future. After this U-turn, investor perceptions of the euro may never be the same again – the euro may remain the currency of most EU states, but as a unit diminished in value and reputation. The euro was conceived as a hard currency. Part of the motivation for EMU was the desire of Germany's EU partners to emulate German post-war economic success, which owed much to a hard Deutschmark that drove German industry to seek real solutions to problems like the 1970s oil shocks, rather than the inflation and devaluation palliatives tried by other European countries; Germany itself would have refused to join any less rigorous monetary union. And until the present eurozone sovereign debt crisis, the ECB had largely followed the Deutschmark model. In its first few years, the ECB withstood scepticism about an initially weak euro, and resisted calls from politicians like Oskar Lafontaine to use (the short-run ability of) monetary easing to boost economic activity. Although the ECB did cut euro short-term interest rates in response to the early (US sub-prime) phase of the global financial crisis and offered eurosystem banks unlimited loans against private sector bond collateral for periods of up to a year, unlike the US Federal Reserve the ECB declined to drive inter-bank interest rates to practically zero or purchase such bonds outright for its own balance sheet. Indeed, until this year the euro was gaining ground as a reserve currency as the more accommodating stance of the Fed and the ongoing deterioration of the US net international investment position raised doubts about the future value of the dollar. Unfortunately, the spreading of the financial crisis to the debt of eurozone governments, especially those of Greece, Ireland, Portugal and Spain, proved to be a sterner test of the ECB's resolve. These countries had got into trouble because, since adopting the euro, they had not taken advantage of its lower interest rates to reduce their borrowing while failing to reduce their labour cost increases in line with the lower inflation of the eurozone. Even countries like Spain which had not run increased public sector deficits during the good times came to face fiscal problems as their economies were depressed by private sector debt and uncompetitiveness. This situation poses an existential threat to EMU, because one way for a member of a monetary union to tackle such difficulties is to secede from the union and reintroduce a national currency that can be devalued to reduce the real value of domestic debt and restore the competitiveness of domestic output. Obviously, this is bad for the holders of that debt, and to the extent that secession of one country makes it seem more likely that others will follow, investors will demand higher interest rates to hold those countries' debt, encouraging them to secede and so on, collapsing the monetary union through a cascade of withdrawals. Understandably therefore, the ECB may have been more inclined to acquiesce to measures to hold down marginal countries' bond yields and to err on the easy side in monetary policy to minimise their incentive to secede from EMU. The first concession made by the ECB was in the collateral requirements for its lending to eurosystem banks. These were set in terms of agency credit ratings, no doubt to distance the ECB from the task of differentiating between the creditworthiness of eurozone governments, with the inevitable consequence that a credit rating agency decision could render a country's debt ineligible as ECB collateral at an inconvenient time. In particular, the likelihood that that Greek government debt would be downgraded below the ECB's normal A- / A3 threshold threatened to restrict the ability of Greek banks to borrow from the ECB and would have removed a key benefit supporting the value of Greek government debt. On March 25th, however, ECB President Trichet said that investment grade (ie down to BBB- / Baa3) debt would be accepted for an indefinite period. And then on May 3rd, with the prospect looming that Greek government debt could even be downgraded to junk status, it was announced that Greek government debt specifically would be accepted regardless of its credit rating. The most shocking climb-down by the ECB, however, occurred on the night of May 9/10th, when in association with the creation by EU finance ministers of a €750bn emergency funding mechanism available to any eurozone country, which added to a €110bn conditional loan facility for Greece agreed on May 2nd, the ECB announced an outright bond purchase programme. Since the ECB had previously consistently resisted appeals to follow the Federal Reserve, Bank of England and Bank of Japan in buying bonds to enhance monetary policy easing, this change raised questions about both the ECB's commitment to inflation and its political independence. Although the ECB presented this Securities Markets Programme (SMP) as a technical initiative "to ensure depth and liquidity in those market segments which are dysfunctional.....to address the malfunctioning of securities markets and restore an appropriate monetary policy transmission mechanism", the SMP does potentially compromise the ECB's ability to hold down inflation in future. The concern is not so much the money-creating effect of government debt purchases, as the ECB undertook to sterilise this by introducing a week-long deposit facility (actually, given an unchanged interest rate target, routine open market operations effectively provide automatic sterilisation anyway), but rather that the SMP effectively represents an additional source of funding for eurozone governments. It is normally undesirable for a central bank to lend to its government partly because that government may be tempted to borrow and spend more than otherwise in the knowledge that, if the volume of its debt sales disturbs the market, the central bank provides a backstop, and partly because the accumulation of potentially depreciating assets on the central bank's balance sheet may restrict the central bank's ability to sell enough assets to absorb excess money to counter an inflationary threat. For these reasons, Article 123 of (the updated version of) the Maastricht Treaty specifically prohibits the ECB from purchasing debt directly from eurozone governments, and buying government debt from the market to relieve a surfeit that is impeding sales of new debt arguably violates the spirit of this rule. The fact that Trichet had denied that the ECB governing council had even discussed government bond purchases when questioned about this at the press conference following their monetary policy meeting on the Thursday preceding the EU finance ministers' weekend summit gives the impression that the ECB was influenced by the inter-governmental negotiation. Given that these discussions were apparently fraught, with French President Sarkozy reportedly threatening to withdraw France from EMU if an agreement including a sceptical Germany represented by Chancellor Merkel could not be reached, it is not hard to imagine that the ECB was pressurised to support the package. The retreat by the ECB is particularly disappointing because it represents a missed opportunity for Europe to interrupt the sequence of bailouts that have characterised the financial crisis since the demise of Lehman Brothers in September 2008 and to differentiate the euro as a reliably hard currency even in adverse circumstances. Allowing at least Greece to be driven to default or restructure its government debt – assuming that Greece could not adjust its finances to service that debt – before compromising the ECB's standards would have established the principle that, in the eurozone, an individual state can run out of money like a corporation, and that the risk premium on debt should be regarded as advance compensation for genuine risk of default. With Greece's reputation for misreporting economics statistics, tax evasion and generous public sector remuneration, there was relatively little support in the rest of the eurozone for a bailout of Greece, and given the size of the fiscal adjustment that Greece must make to avoid default even with the support of its €110bn conditional loan facility, Greece may yet default anyway. It would have been better for the EU to draw the line before, say, Portugal rather than Greece. Many commentators claim that the eurozone authorities' real reason to bail out Greece was that so much Greek debt was held by eurozone banks that even restructuring was likely to impose sufficiently large losses to bankrupt those banks and reduce Europe's banking capacity enough to cripple its economy. If so, this was an unwise decision. First, bailing out a country means saving all its creditors, making it an inefficient way to protect banks. Second, unless banks are formally bankrupted, it is difficult to make full use of their shareholders' and junior creditors' money to absorb losses, making bank failure more costly for the taxpayer. And in Europe especially, bankrupting a bank need not involve disruptive closure and complete liquidation; it is easier to nationalise a failing bank in Europe compared with America where the public are more hostile to state ownership. As it is, the danger is that bank losses on sovereign debt are offloaded to the eurozone states, increasing their indebtedness and intensifying the pressure on the ECB for further accommodation. 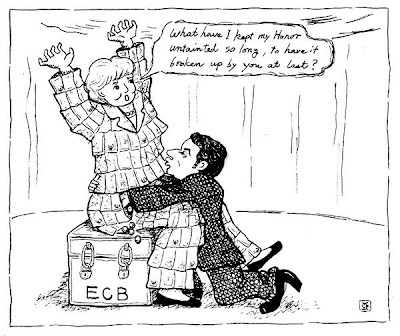 Ironically, in making concessions to abet the eurozone bailout of Greece to avoid a mythical banking meltdown, the ECB may find that it has opened a Pandora's Box. Greece should have been dealt with years before there was a banking crisis or the country ever reached the stage it did. They had a deficit problem upon accession to the euro and it was a more or less open secret that their books were being falsified by 2004 (if I remember right). The only way to understand why nothing was done is to assume that as long as Greeks continued to buy stuff from the manufacturing country that managed to make itself very competitive that sleeping dogs would be left to lie. In short, that the parties that went along with the charade and lent them the money for all this are being bailed out should come as no surprise. I don't think anyone comes out looking very clever from the episode. Welcome back. Nice to have relief from the ambulance chasers that have taken over the space. Thanks for still looking Charles! I agree that none of the eurozone countries did as much as they could have done to avert the crisis. However, I doubt whether Germany's export interest in Greece was the main reason for their acquiescence. According to the German statistical office Greece accounts for less than one percent of German exports, and of course Germany was always likely to bear the largest share of the cost of any bailout of Greece. I suspect that a more important reason why Greece's economic lapses have been tolerated is that it has been regarded as a cultural frontier state - as a Christian country and having emerged relatively recently from dictatorship. It seems to me that the euro is still very much a work in progress. The most peculiar aspect of the eurosystem is the persistence of multiple central banks, each of which acts as paying agent for its government and which could, legally or not, start printing money (not banknotes) in the process of trying to resolve problems of profligate governments within the system. If the euro is to survive long term (it's only been around a little more than a decade), the system will have to unite with much tighter control of currency issuance. See: Do multiple central banks weaken the euro?" Isn't your post a bit dated? The reason I am wondering is because they hype around demise of Euro has died and it seems that if we are not out of the deep at least we are not sinking further. With US coming out of recession, there is a chance that we might make it through the crisis with Euro intact unless I am missing something or the media is ignoring the elephant in the room. Philosophy, ideology, culture? You'll lose your economist license talkin' dirty like that. Your completely right. I lately find myself regularly reduced to taking cheap and simplistic shots at Germany. Something about their tactic of pointing out everyone else's real and imagined shortcomings to divert attention away from themselves. On the plus side, the Greece business might be a nice reminder of the difficulty of crossing that very real barrier that separates east from west in Europe. "it was a more or less open secret that their books were being falsified by 2004"
story was published in risk magazine in either 2003 or 2004, will check and post again later today. i believe the italian cheating was revealed even earlier (2001?). I had a look at your post, and I do not think that there is much chance of the national central banks misbehaving in the way you suggest. The Maastricht article referred to in my post does indeed prohibit the national central banks as well as the ECB from lending to their governments. I think that it would be hard for any eurozone state to organise covert lending to their government. Many central bank staff would have to be involved, and at least one might blow the whistle. Also, the money spent by the government would exist in the form of deposits in the central bank settlement accounts of the banks of those paid by the government, and they would expect to be able to redeem money in these deposits for euros either as banknotes or euros elsewhere in the eurosystem, which could cause problems if the national central bank did not have sufficient assets available to sell to obtain the necessary funds. Actually, while the europols undoubtedly conceived monetary union as a step towards political union, I would question the received wisdom that a single currency requires a fiscal union. In principle, there is no reason why an independent central bank cannot operate fiat money like a gold standard, by simply creating the amount of money (by buying assets) that it considers appropriate for price stability, and compelling national governments to live with it or go bust, just as private sector enterprises do. Hong Kong is effectively in a monetary union with the USA, but certainly not in fiscal union. You are right, I should have written a blog post like this in May, but this commentary was written for a monthly magazine which by its nature must cover events after some delay. I do agree that the worst of the crisis seems to have passed for now at least, and I note that Trichet seems to have made an effort to sound more hawkish lately. Actions spreak lounder than words though. If you in Spain find Germany's persistent economic success annoying Charles, imagine what it is like to be English, and losing to them at football too. Yes, that was a sad day... kind of like being a large Mediterranean country in a May match refereed by Alphaville. Thanks MW. I think many governments were playing such tricks in other ways though - the UK's way of obscuring public sector debt was the "private finance initiative". I agree, and as I recall, Reinhart and Rogoff noted the lack of transparency on government debt in "This Time It's Different". That said, Greece should have had 12 other member states pressuring it to play by the (SGP) rules, which was not the case for the UK. Clearly, enforcement was somewhat lacking. From the sellside: "since the launch of the euro...out of the 12 participating countries, only Luxembourg and Finland have never exceeded the 3% limit. The other countries have broken the 3% limit a total of 41 times. No sanction has ever been imposed". Actually MW, I believe that at least the Excessive Deficit Procedure (EDP) of the Stability and Growth Pact (SGP) does apply to the UK (see note 1 of the 1997 Resolution of the European Council on the SGP), albeit apparently not in a binding way. Indeed, the European Commission has applied the EDP to the UK on a couple of occasions, but was dismissed by HM Treasury in 2006 on the grounds that Gordon Brown's "golden rule" ensured a sustainable UK fiscal position. As the saying goes, pride comes before a fall! This post is a breath of fresh air. Not many are talking about central bank solvency, nice to see that you mention it. From my experience most economists adopt the convenient illusion that central banks as invulnerable gods unbound by the same rules concerning capitalization that we mere mortals face. Also nice to see someone talking about central bank law. Most economists simply assume that central banks face no legal constraints whatsoever, and therefore act as a blank slate for whatever happens to be that economist's particular monetary plan. But central banks are constrained by their constituting articles, and these rules have been drafted for good reasons. As you say, breaking these rules and laws is not costless - it changes the euro forever. Thanks for your appreciation JP Koning. Considering your business, I dare say you recognised the origin of the cartoon. If not, and you and anyone else is interested, the orginal 1797 Gillray cartoon, which introduced the phrase "Old Lady of Threadneedle Street", appears online here. I am also grateful to you for prompting me to think about my infrequent posting too, as I am preparing for a talk on economic and financial blogs to a central bank press officers' conference in September. While I am undoubtedly a slow writer, another reason why I post only occasionally is that I spend most of my blogging time reading other blogs, including their comments and links, and sometimes commenting myself to develop my understanding as much as influence other readers. I generally post on my own blog only when I believe that I have something substantive to say, and then take time to try to anticipate likely questions and objections and to provide links to the sources of key facts on which my view is based. I reckon that if other bloggers did the same, there would be less misinformation and silly ideas out there to mislead and confuse people, while the resulting slower turnover of blog posts could lead to more thoughtful and constructive discussion. I have an idea that financial decisions made with inadequate factual knowledge and understanding (eg of how CDOs worked) were a major cause of the financial crisis, and that its resolution is being hindered by the prejudiced, unscientific and therefore unconclusive discussion about the policy response (eg the stimulus / austerity debate). Nevertheless, I promise to try to post more often! Thank you! No wonder you are a rebel economist! When it comes to Europe, Steve, I am a rebel in another sense: I cannot see why countries should not (a) default/restructure and then (b) leave the euro if they wish, and I see no need for a fiscal union for the euro to survive. From what I have read, it seems that it will be hard for Greece, and Ireland too if it insists on fully guaranteeing its banks’ senior bond holders, to avoid default without being bailed out by the other eurozone or EU countries – ie primarily Germany. And given the sacrifices that Germany has made to remain competitive, and its export success outside the EU, I can understand Germans’ reluctance to take on any major burden to bail out less disciplined countries. If the debt burden of Greece and Ireland is too large for them to plausibly repay, lending them money now, such as via the European Financial Stability Facility, simply postpones the problem, and gives the private sector time to reduce its exposure before the inevitable default. Better to default now and catch as much private sector money as possible. I can think of at least three reasons why eurozone governments might be reluctant to precipitate a Greek or Irish default now, other than the obvious one of trying to forestall the problem for their successors to deal with. One reason is that the problem is complicated by the involvement of banks. In the Irish case, the government may be reluctant to haircut bank senior bond holders because they rank pari passu with depositors in the creditor hierarchy, and haircutting even large depositors may be politically troublesome. But the Irish government could overcome this problem by simply guaranteeing the full value of all deposits regardless of the outcome of any insolvency process. In the Greek and Irish cases, German and French governments may want to avoid a sovereign bankruptcy because their banks own many of the Greek and Irish government bonds, meaning that Germany and France may end up bailing their banks out if they do not rescue the sovereign. But it would be more efficient for the German and French governments to let Greece and Ireland default and, if this does bankrupt their banks, to nationalise, recapitalise and refloat them, because at least this draws on private sector (in the first instance, bank shareholder) wealth first, thereby minimising public expenditure and avoiding moral hazard. The second reason is that it would be better for Greece or Ireland to default later, when they have reduced their primary budget deficit to zero, to avoid a sharp forced contraction when default excludes them from debt markets. But, given that both Greece and Ireland are not far from a primary surplus now, a glide path to zero funding could be provided by relatively small transfers from the other members of the eurozone. The third reason is that the default of Greece and Ireland might encourage contagion to, say, Portugal, as its debt became unsaleable when markets anticipated its default and therefore precipitated exactly that. But eurozone governments have sufficient financial power to break the chain of defaults there, by simply lending, or (if there really is a possibility that Portugal might default) transferring, enough money to prove the market wrong. There is no reason why a defaulting country should not leave the euro and reintroduce a national currency. A country may choose to do so to engineer a rapid recovery of competitiveness. However, it is not clear that workers would find this more acceptable than wage cuts, and the euro may have become so entrenched in national life that the public would not want to change currency. European countries should think of the euro like a gold standard, effectively provided externally by the ECB. If they cannot meet their euro obligations, they default. Fiscal transfers may occur if sufficient European sympathy exists, but that is a hope, not a right. And once it is accepted that default of some eurozone country is probably inevitable, it becomes a matter of how to manage the process to minimise disruption. "However, it is not clear that workers would find this more acceptable than wage cuts, and the euro may have become so entrenched in national life that the public would not want to change currency." My view on this is that de-euroization will be very difficult, probably impossible. Any attempt to reintroduce drachmas/punts will at best result in some sort of mongrel float. But I do agree with you on the attractiveness of default.